Regional play during the 2016 GNBA season concluded over the weekend in Waukegan. After three games, a number of players emerged as top performers and will look to continue that momentum in the finals later this month. Here are some of the top performers from the opening weekend of GNBA in the seventh grade division. Baker had a huge scoring weekend, averaging 23.0 points per game. He ranks second in the league in scoring, shooting 75.5 percent from the field. He also shot 38.5 percent from three-point range. Baker also ranks eighth in the league steals (2.3) and fifth in floor impact (28.3). 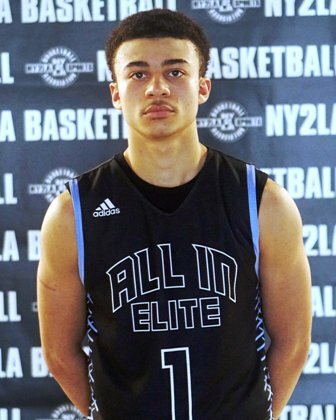 A talented young forward with instinct and upside, Blum was active throughout the weekend without the basketball and that activity placed him among the top ten in the Matrix category, which measures his impact without the basketball. One of the top rebounders for his age this past weekend, Blum was an integral part in a solid opening weekend for the 7th grade Crusaders. Austin averaged a double-double in Waukegan. He posted 17.0 points and 10.3 rebounds per game. Austin shot 63.6 percent from the field. He ranks second in floor impact (30.0) and fifth in efficiency (13.0). Austin is also top 10 in the league in scoring and rebounding. Flory and Ray Allen Select went undefeated in regional play. Flory ranked top 10 in both efficiency (11.0) and floor impact (26.3). Flory is sixth in the league in scoring (17.0 ppg) and seventh in rebounding (7.0 rpg). Flory shot 66.7 percent from the field and added 1.0 assists and 1.0 blocks per game. Heinen was eighth in the league in efficiency over the weekend. He averaged 9.3 rebounds per game, which stands fifth. Heinen averaged double figures in scoring at 10.0 points per game on 56.5 percent shooting. He also ranks inside the top 10 in both offensive and defensive rebounding. The talented young guard led his age group in Assist to Turnover ratio for the weekend and he was also has a solid floor impact, which helped his team to a solid 2-1 mark. Holden has instincts, feel, and skill and the talented young guard was impressive in displaying that and more this past weekend. Jackson and Team 1 Tyus went 3-0 in Waukegan. He averaged 10.0 points per game along with 2.3 rebounds and 2.3 steals. Jackson led his team in floor impact at 15.0 and player efficiency at 5.3. A talented young 7th grade prodigy, Johnson paced George Hill throughout the weekend and his efforts helped them to a solid 2-1 mark in their division. Johnson showed an ability to score at all three levels and as his activity elevated throughout the weekend so did his production. Johnson is another of the many intriguing and talented young prospects in the 7th grade division. A raw and upside type young forward, Madyun finished around the basket with a high level of consistency and he paced a balanced attack on the way to the Minnesota Phenom 7th grade group finishing 2-1 on the weekend. Still raw and developing, Madyun is an intriguing talent who impressed in flashes this past weekend. Nesbitt helped lead Butler Elite to a 3-0 weekend in Waukegan. He averaged 20.3 points per game, which ranks fourth in the league. He’s also third in steals (2.7) and first in free throw percentage (100%). Nesbitt stands fourth in player efficiency (13.0) and seventh in floor impact (27.3). Nwaokorie averaged 16.0 points per game on 69.0 percent shooting in Waukegan. Nwaokorie was ninth in the league in scoring. He was also among the league leaders in floor impact (21.3) and efficiency (7.7). Nwaokorie chipped in with 3.3 rebounds and 1.0 blocks per game. Price ranks fourth in the league in floor impact (28.7) and third in efficiency (14.3). He also stands No. 10 in the league in scoring (15.7 ppg) and fourth in rebounding (10.3). He shot 71.0 percent from the field and averaged 1.7 steals per game in regional play. Terry averaged 16.0 points and 6.7 rebounds per game in regionals. He shot 60.6 percent from the floor, aiding his strong scoring weekend. Terry ranks No. 10 in the league in floor impact (23.7) and sixth in offensive rebounding (3.67 rpg). All-Ohio Purple went 3-0 in regionals in large part to Walker's efforts which paced a balanced and talented team. He led his team in scoring at 10.0 points per game and floor impact at 12.7. Walker shot 55.6 percent from the floor. He was even better from beyond the arc, hitting from downtown at a 66.7 percent clip. Weir had a huge weekend, averaging 23.7 points per game on 51.0 percent shooting. He led the league in floor impact (43.3) by a wide margin and also tops the seventh grade division in efficiency (17.0). Weir also stands atop the league in rebounding, pulling down 16.0 boards per contest. He’s also second in blocks (1.3 bpg). Williams averaged a double-double with 14.3 points and 12.3 rebounds per game in regionals. He ranks second in the league in rebounding, second in efficiency (15.3), and third in floor impact (29.0). He shot 65.4 percent from the field and also added 1.0 assists and 1.0 rebounds per game. Williams averaged 21.7 points per game in Waukegan, good for third in the league. He shot 62.5 percent from the field, including 63.6 percent from three-point range, good for ninth in the seventh grade division. After three games, Williams also stands ninth in floor impact (26.3). Wilson helped lead Kessel Heat to a perfect 3-0 mark in Waukegan. Wilson contributed across the board, averaging 12.7 points, 2.3 rebounds, 2.3 steals, and 1.3 assists per game. He ranked ninth in player efficiency (10.0), seventh in field goal percentage (85.0), and fourth in assist-to-turnover ratio (1.33:1). One of the most versatile players in GNBA, Wonders averaged 19.3 points and 7.0 rebounds per game. Wonders shot 74.2 percent from the field and also averaged 1.3 steals per game. He ranks sixth in floor impact (27.7) and seventh in player efficiency (10.7). He’s also top 10 in both scoring and rebunding.